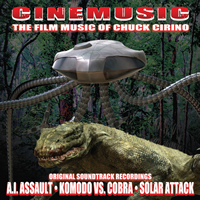 BuySoundtrax Records presents Cinemusic—The Film Music of Chuck Cirino. This collection features music from three films scored by Chuck Cirino this past year: A.I. Assault aka Shockwave, Komodo vs. Cobra, and Solar Attack. Chuck Cirino did not start his career as a composer, but rather as a special effects programmer on the East Coast. After relocating to California, Cirino transitioned into directing high-end special effects television commercials. His first work as composer was for the 1980 cult film Gypsy Angels, which starred Vanna White and Richard Roundtree. Since then he has scored films for Roger Corman, directed music videos for bands like Earth, Wind & Fire and The Dickies’ Killer Klowns From Outer Space, and has recorded over 40 music soundtracks for feature films like Sorceress, The Return of the Swamp Thing, Hard to Die, Transylvania Twist, and the three films whose score is represented on this collection (Shockwave, Komodo vs. Cobra, and Solar Attack). Cirino has worked as a producer, director, filmmaker, videographer, animator, special effects technician, editor, and composer. He executive produces and directs Weird.TV, a television series featuring weird Americans, bizarre news, unbelievable events and outlandish skits. Chuck’s credits also include executive producer and director of the Sci Fi Channel projects, Worldwide Weird and Warped In Space, and Baberellas; an independent Sci Fi feature distributed by Xenon Pictures. CINEMUSIC is a limited edition, with only 1000 copies being pressed. As a special offer, the first 100 people to order the album will have their copy autographed by the composer at no additional charge.